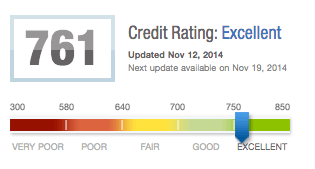 It is VERY important to check your credit score at LEAST once a year to make sure everything is going well. With the recent data breaches, it’s a good idea to check it if you haven’t checked it in a while (guilty!). And it’s VERY easy to check. I just signed up for Credit Karma (this is a free plug, I don’t receive any compensation for recommending their website). Verdict: I LOVED their website! They give you lots of credit information, tips and suggestions. I found out that my credit is finally excellent! I’ve come a loooong way. And I received an A on my credit report card. This was mainly due to my low credit card utilization. I suggest you head over to CreditKarma.com ASAP so that you can have a look at your credit score and start the credit rebuild or monitoring process. This time 4 years ago, I had a LOT of mistakes on my credit report and I would have NEVER known if I wasn’t checking my credit on a regular basis. Do you use Credit Karma? Do you use any kind of credit monitoring? When is the last time you checked your credit score?